I love to cook, no secret there. And I really love to share my meals with friends and family. But I work full time, and we seem to have a very busy social life. It can be hard to find the time to host a dinner party with everything else that is going on in life. I actually prefer to host midweek, after work. I have to cook dinner anyway so why not have a few friends over to share? Plus I don't get myself all crazy cleaning unnecessary things in the house like I would on the weekend. It is what it is.....and another bonus? I'm already showered, dressed, and have makeup on! When I host on the weekend the last thing I take care of is me....the house looks perfect but I'm answering the door with wet hair and no makeup on. So....what are my secrets for hosting a midweek dinner party? And sometimes I even listen to my own advice!! Tonight I am hosting dinner for 6. The menu? Cheese Board and Cocktails to start. Easy. Salad with mixed greens, cranberries, sliced apple, red onion, goat cheese, and pistachios - dressed very simply with olive oil, blackberry ginger balsamic vinegar, salt, and pepper. The Very Best Veggie Lasagna Ever. Remember when I told you about that? And I made a few for the freezer? Yup, that was for dinner parties. I pulled a large one out of the freezer on Sunday and put it in the fridge to thaw. I'll cover it with foil and pop it into the oven when I get home from work. And some lovely soft squishy Snowflake Rolls I picked up at the market last night. Yummmmmm!! Dessert? Haagen-Dazs Ice Cream with Sliced Strawberries. To make things even easier on myself when I get home tonight I did the prep work before I left for work. 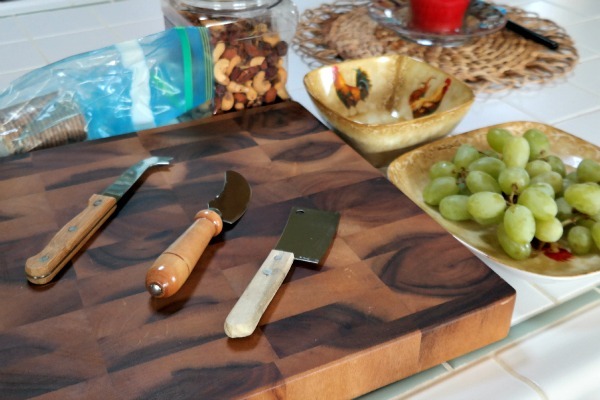 The cheese board is out on the counter with the knives and crackers I need....the grapes are washed and ready....I left out the mixed nuts along with a bowl....and covered the whole thing with a tea towel. 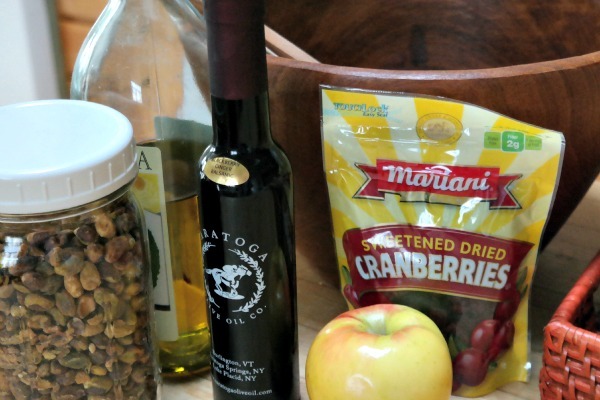 The big wooden salad bowl and salad servers are out on the prep island along with the dried cranberries, an apple, the pistachio nuts, the olive oil, and the blackberry-ginger balsamic. I forgot the red onion...drat. I hope I don't forget to add the onion to the salad! 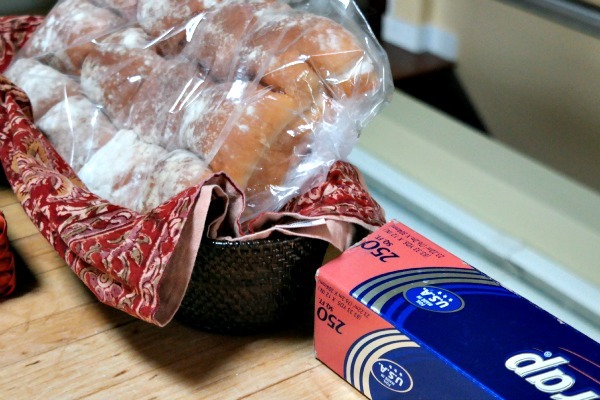 The bread basket has a clean napkin liner ready to go, the rolls are left out where I won't forget them, and the foil is right next to them so I remember to wrap them and pop them into the oven when I take out the lasagna. 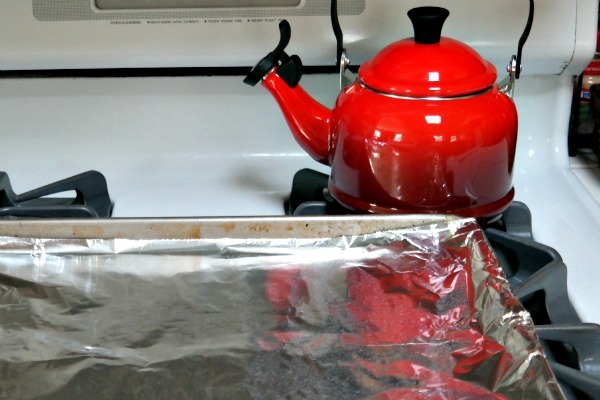 I even lined the baking pan in foil already - the lasagna will be put on top of here and popped into the oven - the foil makes cleanup of any bubbling over super simple. 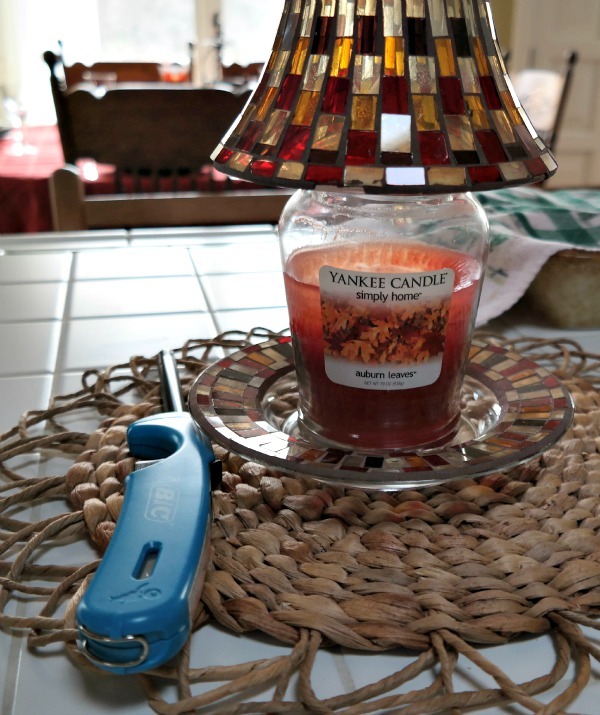 I trimmed the wicks of all the candles and refilled the dining room table candles that had burnt out. I even left out the candle lighter. 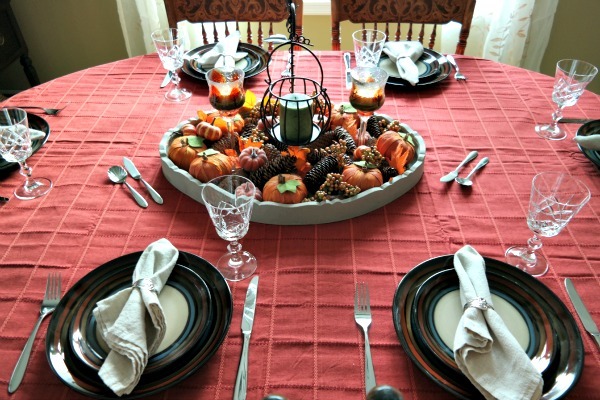 I took the clean plates and silverware right from the dishwasher this morning and set the table first thing. Kill two birds and all that! What are your tricks for K.I.S.S. Entertaining? My tricks are about the same as yours, except I really need to start freezing things like lasagna, so that I have a ready to go meal for last minutes guests. I had a wonderful time catching up with you. You're so inspiring! And your daughters are gorgeous, just like you. I'm envious and curious, have you always been so together? I want to be as efficient as you seem, however I don't think it's possible to get there from where I am. I love that KISS...I need to keep telling this to myself...because I seem to be able to complicate the simplest of tasks! Hugs sweet lady!! Ahhhh KISS - it's the secret to life, I think!! Of course I don't ALWAYS follow it but when entertaining I really do try to keep it as a mantra. Nothing like a good KISS, am I right? Ooooh that candle looks like it would smell amazing! All my candles smell amazing, Ellen!! I'm a little bit addicted, I admit!! Lovely. Seems like you have it down to a science! I am a cocktail party hostess! If it's a dinner party, we go out, preferably to a place with live music! Maybe we should come to your house instead! Any time, Kim!! I'd welcome you with open arms!! You've got it down to an art and it sounds like you are a very relaxed hostess. Dinner sounds delish! You definitely seem to have taken the stress out of entertaining! 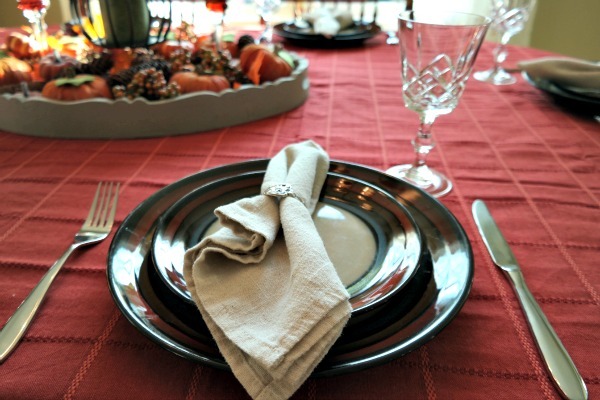 I would never have thought to host a dinner on a weeknight, but you have convinced me it's a great idea! Oh, Amy, it's a fabulous idea!! It works so well for me! Sounds like you got it goin' on mountain mama! Heading over to Kris's now to see what you're up to ;).